The weather has been pretty dicey on the East Coast lately. Warm, then cold. Sunny, then rainy. Often all in the same day. Of course this is when all the kids (and half the parents) get sick. My poor kid caught a nasty virus this week and I had to keep him home since he was still pretty warm. He wasn’t so bad the second day and I needed to get him away from the television and as luck would have it, we had a few Science-Art Fusion Kits from The Young Scientists Club to test out. We started with the Crystals kit, which included instructions for 10 different experiments. It is worth noting that almost all of them required Borax, which is not a product I actually keep handy. 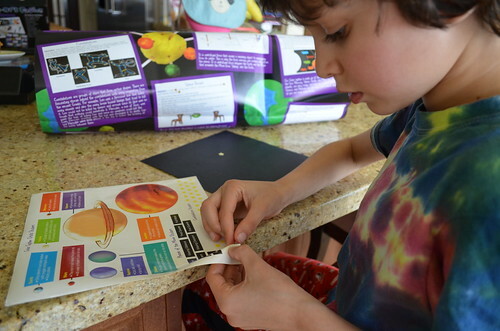 While the vast majority of items needed for the experiments are included in the box, Borax was not one of them and my kid was pretty disappointed to hear that we had to tuck the Crystal box away until our next grocery store run. .
We moved onto the Space kit and had a much easier time with the activities in the box. While we did not have the time or energy to make the play dough that is prominently featured on the outside of the box, we were able to make our own constellations and rig the balloon- powered rocket ship. The rocket ship project was actually really fun and my son had a blast colouring the rocket and tying the string to a couple of folding chairs that we set up in the kitchen. We made sure we talked about propulsion and why the balloon was able to move the rocket along the string. 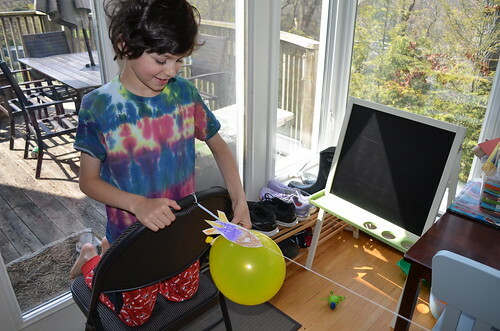 He was still re-blowing up the balloon and making the rocket fly an hour later when his dad walked in the door. I decided that since we still had so many different experiments to do I would send the last box, the Explosion kit, to school for his grade one class to try together. His teacher may not like me anymore but I’m sure the kids will all love it! I will update this post once I hear from the teacher with feedback regarding the kit we sent. The kits are geared to ages 5 and up and from what I could tell, definitely require adult supervision and assistance. The kits retail for $19.99 USD and are available online. This would make a fabulous teacher/class gift or would be great to keep on hand for a rainy day! These kits look like a lot of fun!! This does sound like a fun activity that is good for learning, too! I’m amazed at how many DIY and crafts require borax, I don’t know anyone that has it hanging around! The Balloon power rocket totally takes me back!!! One of my sons favorites when he was younger! ….and the prices are pretty reasonable! This would be great to have on hand for rainy days this summer. My kids would enjoy it. Great idea! I love when you can make learning fun for kids and also fire their imaginations!! This looks like a lot of fun! 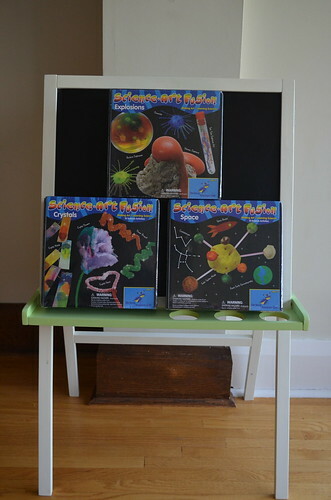 My nephews and niece would enjoy these kits and keep them from getting bored this summer! This look so fun! My little guy loves science experiments!